The Nest got people to look at formerly mundane appliances like a thermostat in a new way, as something that should be smarter and could stand to get better-looking too. We loved the last Honeywell Wi-Fi Smart Thermostat that we tested, but dinged its design compared to the circular elegance of the Nest. Now the company that invented the Round thermostat back in 1953 is back with a new line of smart home devices called Lyric. And first up is, you guessed it, a smart thermostat. It looks familiar—which is to say, beautiful—but it takes a different approach to saving you money than the Nest. Instead of trying to learn your patterns over time, the Lyric thermostat doesn’t worry about patterns. Instead, it uses your phone’s geolocation features to start conserving energy as soon as you leave your house. The Lyric thermostat assumes that if your smartphone is at your house, so are you. You can register your family’s phones with the app, and it’ll use the geofencing features in iOS and Android to tell when everybody’s left for the day. Once you get within a few miles of your house, the thermostat springs back to life, heating or cooling your house so it’s at your preferred temperature (or at least getting there) as you stroll through the door. Looks familiar, works a little differently. The Fine Tune feature is pretty smart too. You know how sometimes the weather forecast has two temperatures: the real air temperature, and whatever it actually “feels” like, adjusted for the wind chill or the heat index? The Lyric is programmed to make those same adjustments inside your house. Fine Tune factors not just the indoor temperature, but also what it’s like outside, and the humidity (the Lyric houses its own humidity sensor), so it can make adjustments like running your system’s fans more or bumping the temperature up or down a degree. A proximity sensor lights up the Lyric when you walk up to it, showing you the temperature and status. LEDs around the outside of the Lyric cast a glowing ring on your wall: blue when it’s cooling, orange when it’s heating, and green if it’s in energy saving “away” status. Glanceable weather on your way out the door? Nice touch. You can twist the ring to make adjustments to the temperature, or press one of the touch buttons. One button sets the Lyric to “away,” which can be handy if you’re leaving your phone behind on purpose. The other button shows you a brief glimpse at the weather forecast for the next 12 hours—enough to see if you should grab an umbrella on your way out. The Lyric app is as smart as the thermostat. First, it walks you through every step of the installation process with videos and even interactive guides. For example, when you remove the front of your old thermostat, you’ll see different colored wires attached to lettered connections. Since most people don’t have a lot of thermostat-installing experience, it can be intimidating. Lyric's app for iOS and Android lets you set up profiles for various activities. The app prompts you to snap a photo and note which wires go to which connections, and saves that information for you, so when it’s time to reconnect the wires to your new thermostat, you have a photo and a description of how it should go. I occasionally still have to remind myself “righty tighty, lefty loosey,” but after watching the installation videos, even I was confident I could install it. 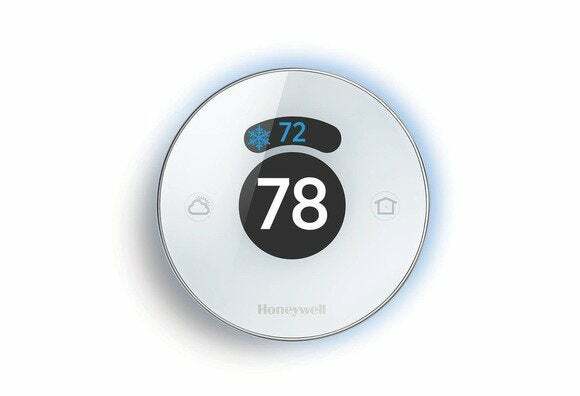 Once the Lyric is installed and configured to your heating and cooling system, the app helps you connect the thermostat to your home Wi-Fi network, and tell it your location so it can pull local weather data. The app also gives you plain-English alerts when you need a new air filter or other maintenance—it can even help you find a professional in your area. And while it doesn’t bog you down with scheduling for every day of the week, you are able to set up shortcuts, to run on a schedule or just on demand. If you like a particular temperature when you’re sleeping, or working out, or quicker air cycling during a party, you can set that up. Lyric is available now from a professional contractor, and DIY types can pick it up at retail this August, for $279.